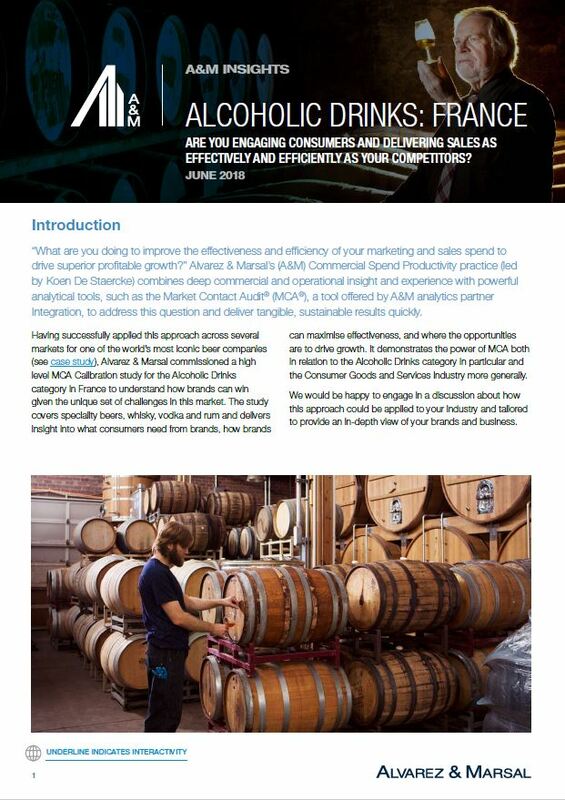 Using the Market Contact Audit® (MCA®), a tool offered by A&M analytics partner Integration, Alvarez & Marsal commissioned a high level MCA Calibration study for the Alcoholic Drinks category in France to understand how brands can win given the unique set of challenges in this market. It demonstrates the power of MCA both in relation to the alcoholic drinks category in particular and the consumer goods and services industry more generally. If you would like to know more, please get in touch. We would be delighted to provide further case studies on how MCA has delivered valuable insights to drive increased market share. We can help you explore how Alvarez & Marsal’s distinctive approach to Commercial Spend Productivity can improve the performance of your brands and Sales and Marketing teams.